Tyshaun Prince and Rico Dynamite def RJ Ruiz and Brute Baretto. After the match, Baretto turned on RJ and attacked him. “Uptown” Andy Brown and Richie Slade wrestled to a 30 minute time limit draw. 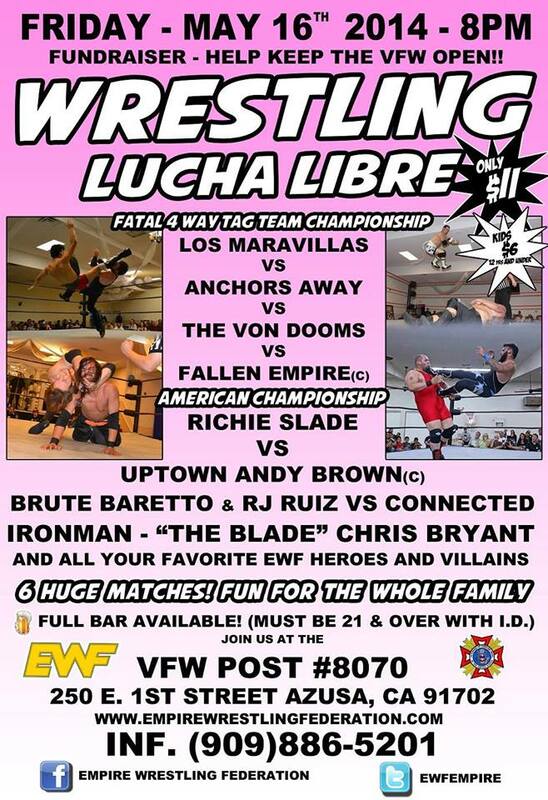 Anchors Away def Los Maravillas, the Von Dooms, and The Fallen Empire (actually Ryan Taylor by himself, as Mondo Vega asked for the night off) to become the NEW EWF Tag Team Champions. MAIN EVENT- FANS PICK THE STIPULATIONS GRUDGE MATCH! The World Famous EWF Intermission Photo Opportunity!